Well, I finally bit the bullet, much to my dismay. 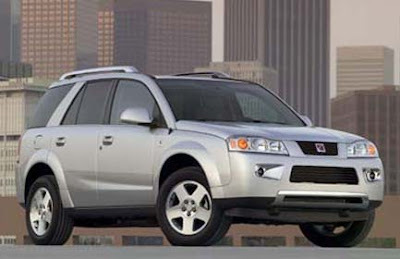 We're getting the 2006 Saturn Vue. I say dismay, because we test drove it on Tuesday . . . and I've had a check in my spirit ever since. I just have not been able to pull the trigger and follow through on it. I don't know if it's because we just bought the washer & dryer on Monday or if it's God telling me "No." I prayed for more guidance if it truly was a "No," but woke up today feeling a little more clarity that we should finally move forward, so I'm not sure what it was. Me: I'm just unsure about this, because it's not like we need the Vue. There's no specific reason we'd be getting it. We could just start over and look at cars. Tony: Yeah, well there were alot of other reliable guys out there, but you didn't pick one of them to marry, you chose me! Yeah, he seriously said that! So, I'm getting a vehicle today. I'm the same way when it comes to big purchases...I get very nervous and hesitant. But it sounds like you thought and prayed it through so I wouldn't worry too much. But yay! A new car! Woo Hoo!! I love it! I completely understand why you were hesistant about such a huge purchase. Don't you just love it when you pray for an answer and wake up the next day and it just seems so obvious? I love it! How exciting!! I can definitely relate on the constant back-and-forth with decisions. We just bought a car too, and for once I actually felt pretty confident with the purchase because we took our time and did some shopping around. It sounds like you did too so I'm sure you made the right decision :) Have fun with the new ride! That's awesome - Congrats! I love new car smell! Awesome! I've been drooling over the Saturn Vue for about a year now. We're almost ready for a new vehicle...and I'm hoping this will be it. You'll have to let me know what you think about it. Have a great time driving your new car this weekend! This is what my husband drives and so far it's worked pretty well for us. We do tend to overpack for camping trips, but I think that's more an issue with us bringing too much stuff than actual space available in the Vue. That is exciting! I hope you love it!